Results for this year's Event can be downloaded here. Yet again Shap was blessed with good weather for the Event weekend. Initial low cloud on the tops soon lifted to give good visibility though the temperature rose significantly in the afternoon making for thirsty walking conditions. Unfortunately these observations are second-hand as the author of this report was busy inside Event HQ for most of the weekend! 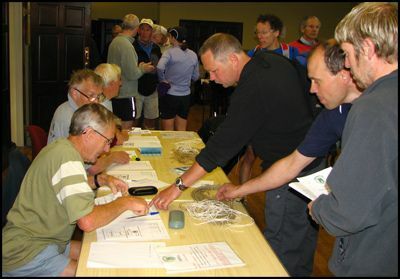 After a slow start entries had picked up considerably in June and with over 20 entries on the day the final score was 157 entries and 143 starters split over the seven possible variations of Rings. This represented a 30% increase over last year, itself a record, and although vastly encouraging gave considerable cause for concern about our ability to cope with these numbers. As ever, man (and woman) power to run the Event was in scarce supply especially as, for various reasons, several stalwarts were unavailable this year. Happily we were boosted by welcome support from several neighbouring groups to whom grateful thanks are due viz. Yorkshire Coast, Morecambe Bay & Bowland, Westmorland & N.Lancs and Northumbria. Early doors is always a problem but, once breakfast was over for the Hall full of overnighters, a host of volunteers arrived before 07.00 to cope with the usual tasks of parking, registration, tea-making etc. 08.00 arrived eventually and we were able to say goodbye to the mass-starters, breathe a sigh of relief, and get on with the main work of the day. There is a short but very important window of time between 09.00 and 09.30ish when final start lists for each route have to be accurately produced and checked so that the outside checkpoint marshals can leave with them to open their various checkpoints. Unfortunately a cool brain and steady computer finger is required for this together with the ability to fend off interruptions and cope with rising panic levels. Despite the fact that none of these attributes are possessed by the given operative it is amazing that once again we managed to open Truss Gap just as our old friend Colin (aka Lord of the Rings!) was arriving – albeit a trifle early. Although our engine room i.e. kitchen was relatively understaffed this year the fact that C.I.C Barbara had once again spent many hours prior to the Event in food preparation gave us more than a head start. Cumbria is jealous of its reputation for providing high quality home-made food and this year was no exception. The ladies beavered away all morning making sandwiches, pasta salad and innumerable other tasks and were just in time for the flood of hungry walkers and runners returning to fill a hole after finishing their first Ring. Peaking at about 14.00 a manic period of taking orders, serving and tidying up required all hands to the pump. Throughout a long afternoon and evening Derek also imposed an aura of calm authority on the lightly manned check in desk; recording ins and outs, changes of mind and route, and retirements not to mention producing a steady supply of badges and certificates for finishers. CONTROL is the grandiose title given to the ‘boss-man’ and is equivalent to general dogsbody / jack of all trades etc. Summoning support is usually by the command – ‘hey, you’re not doing anything; come and do this, take that over there, what do we do about the other… Never was the phrase…The buck stops here... more apt when the call came to deal with the irate farmer waiting outside the Hall. Disappointingly he blamed us for gates left open thus allowing sheep to stray. To say steam was coming out of his ears was an understatement and was accompanied by threats of de-railing future years’ plans, padlocking gates, sending bills for compensation - all transmitted with an overpowering exudation of general unfriendliness. It was obvious that argument would be in vain and that nothing short of a grovelling apology and the deployment of people-skills finely honed over many years would suffice to retrieve the situation – not to mention the instant application of a goodly dollop of silver! Hopefully the day was saved and though it is far from certain that ‘our’ walkers were the culprits, it just goes to show how a moment’s thoughtlessness and inattention can so easily ruin things for so many. An immense amount of work goes into recording and tracking entrants throughout their walk or run. Individual tallies are prepared, lists are produced, checkpoint marshals clip and record and sweepers sweep. Depressingly every year at least someone goes AWOL if only temporarily. Luckily so far this has invariably been due to a recording error and the ‘missing’ person then appears at the next checkpoint. Unsurprisingly this year was no different though when the missing-in-action number failed to be recorded at two consecutive checkpoints alarm bells started to sound! It’s at times like these when Control earns his money (!? ), systems are tested and lessons are learnt. With visions of mountain rescue deployment imminent, the emergency contact number was hunted out - ‘Sorry to bother you, sir, but we’ve temporarily lost your father. I’m sure there’s nothing to worry about but it would be helpful if you had his mobile number’. And the relief when he eventually answers in a bewildered tone – ‘Yes, I’m halfway round Ring 2’! With the best will in the world and especially at busy times checkpoint recorders can miss people. The ultimate responsibility for being recorded must rest with the entrant. Emergency contact phone numbers are a godsend. Mobile phones if carried (and switched on) are also a godsend – if the number is known! Amazingly a similar scenario occurred after dark when two more walkers were rumoured to have retired before a checkpoint and intended getting a taxi (some hope) back to HQ. After following the above procedure they were eventually contacted, located and rescued from the A6 some miles north of Shap! Throughout all these shenanigans the Event, of course, continued. Ring 1 was closed and all the single Ring walkers went home hopefully content. Walkers continued to walk and runners to run – and how they did run. After a year’s break our previous record holders returned with a vengeance. Colin Travis loped round on his impossibly long legs to lower the ‘record’ by a full hour to an impressive 12 hours 22 minutes. 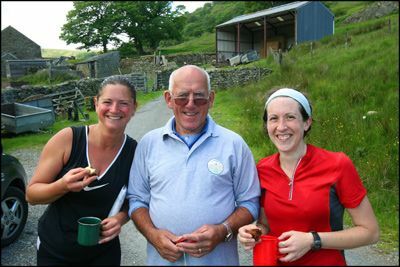 Marie Doke also returned and, together with Helen Mavin, set the fastest ladies time of 15 hours 7 minutes. Mere mortals meanwhile were completing their two Rings of 40 odd miles and by the early hours of Sunday morning the Ring 2 sweepers had returned after mopping up and bringing home the stragglers thus allowing the Ring 3 sweepers to set away. 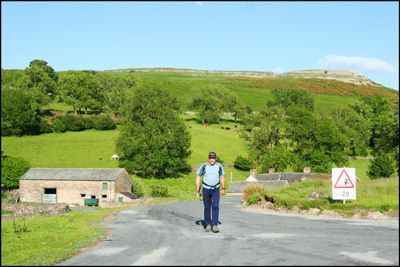 The challenge of the ‘Three Rings’ is largely in the will and ability of contenders to leave the Hall a third time, usually in the dark, after 42 miles and having just endured the rigours of Ring 2.This year another record was broken as 31 of the 54 entered for all three Rings did just that and completed the course. So throughout another long and lonely graveyard shift at Hall HQ the patient checkers and kitchen staff welcomed intermittent finishers until the last arrived footsore but triumphant with the sweepers at 09.30. Of course the story does not end here – indeed it never seems to end! The Hall was eventually cleared, cleaned and closed as the rain arrived just before midday leaving other tasks such as visiting and thanking friendly farmers and checkpoint providers, producing results and writing reports for another day. Will we do it again – of course – the date for your diaries is 19.6.10 just 3 weeks after the Scottish 100! What a fantastic 100 it would be if you added another 2 Rings like these 3. Well thanks Phil – but dream on!